Your personal photography projects are just that personal and I'm happy to add the creative touch to bring your vision to life and make your session uniquely yours. I would love to work together and follow your family through each and every milestone. You're glowing and your belly is quickly growing. Now is the time to document these fleeting moments. Maternity sessions are available in the studio or on location. I'm happy to cater to your every whim: whether you want a casual session or all out glam, I'm excited to work with you to bring your vision to life. Little fingers and sweet little toes. Did I mention those eyelashes? These details change so quickly. Documenting these moments will preserve the details so you can cherish them for years to come. Newborn sessions are available in studio, in your home, and even when baby is fresh right in the hospital. You've documented those sweet newborn moments but what about the other special milestones? Everyday they are making you proud accomplishing something new. At four months we'll photograph tummy time with your baby holding their head up. At eight months they will be sitting up. Then at 12 months we'll cheer them on as they stand for photos. Milestones are a wonderful way to document your baby's growth and accomplishments. Yay! It's birthday time. The first year flew by and now it's time to celebrate. 12 month sessions are a blast. We'll start with portraits of baby, then family photos, and we'll finish up with a fun and messy cake smash session. These fun photos make wonderful invitation and thank you cards for your child's first birthday. Let's plan a fun theme to really personalize your session. The sky is the limit! When was the last time you had a quality family portrait taken? I'm not talking about a cute iPhone shot but a timeless photograph that can be passed down and treasured. Your portrait session starts with a consultation as we plan your personalized session. We'll discuss all of the important details from location, timing, what to wear, and even personal grooming. Wait until you hear my story on why personal grooming suggestions are now part of each consultation! We'll discuss goals for your session and how we can best bring your vision to life. There really are no time constraints on family sessions. I like to plan your session with plenty of time in between clients so we'll never have to rush. Each session is different and timing depends on a few variables. I like to pay close attention to my clients to ensure that the session is moving at a pace that is comfortable and appropriate. Did I mention I was a teacher for many many years before moving to Maryland? Sometimes I really miss it and I have to say that photographing children brings me right back to my days teaching. I love it. I'm also happy to offer both indoor and outdoor locations to fit the needs of your children. I have two studio locations to use as the preferred OR backup location. I'm excited to be located in the Arts District of Annapolis with 1500 square feet of space to create. My studio/gallery space is called Bokeh and you can learn more about everything this space has to offer here. Want to be the first to know when portrait appointment become available in Methuen, Massachusetts? Drop us a line and we'll fill you in on upcoming availability. It's time for curly cuddly newborn photos in the studio. It's best to have these sessions before baby is two weeks old so be sure to book early to ensure availability. Your session will last up to 2.5 hours and you'll have full access to my extensive prop collection. Before your session we'll chat and have a style plan for the day of your shoot. Please let me know if you have any items of significance you'd like to incorporate into your session. Two weeks after your session you will receive an online gallery where you can view and download your images. Your gallery will have a minimum of 30 photos in it. Because newborns change so quickly I'm happy to pop in and visit you at the hospital and capture those very first moments. 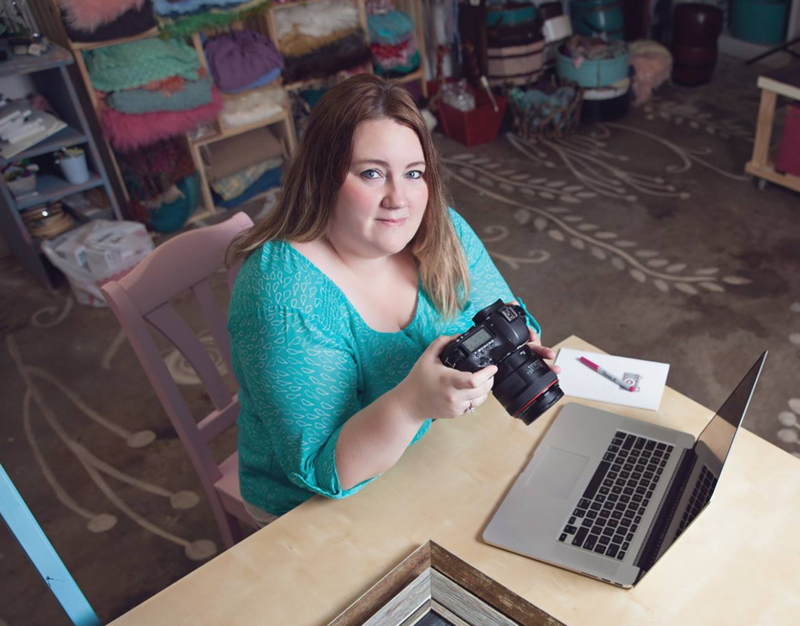 These sessions last up to 45 minutes and include documentary style photos of baby, baby with parents and siblings, and baby's details like little fingers, toes, and fuzzy hair. These sessions are best the morning after delivery when baby is one day old. Two weeks after your session you will receive an online gallery where you can view and download your images. Your gallery will have a minimum of 30 photos in it. Sometimes you just want to head home from the hospital and get cozy and comfortable in your own environment. If that's the case I'm happy to come to you to document your new bundle of joy in your home. This lifestyle session will include many candid shots of your family and baby around your home and in the nursery. Two weeks after your session you will receive an online gallery where you can view and download your images. Your gallery will have a minimum of 30 photos in it. During baby's first year they hit exciting milestones like holding their head up at 4 months, sitting up at 7-8 months and standing at 12 months. Birthdays are great milestones sessions as well. These sessions are usually wrapped up under an hour depending on how much baby is enjoying their session. Please let me know if you would like to include a cake for a Milestone cake smash session. Two weeks after your session you will receive an online gallery where you can view and download your images. Your gallery will have a minimum of 30 photos in it. It's time to show off that bump in style. We can keep it casual or we can glam it up with a gown. Your session will last about an hour and we can pick a location that fits our vision for the session. Maternity sessions can also take place in the studio. Two weeks after your session you will receive an online gallery where you can view and download your images. Your gallery will have a minimum of 30 photos in it. Family portrait sessions can be scheduled throughout the year. They can take place in the studio or at a location that we determine fits our vision for the shoot. These sessions can range from 45-90 minutes. Sometimes with younger children we work fast and other times we take it slow. Two weeks after your session you will receive an online gallery where you can view and download your images. Your gallery will have a minimum of 30 photos in it. 50% is due to book your session and the remainder is due at your session. Book Now.